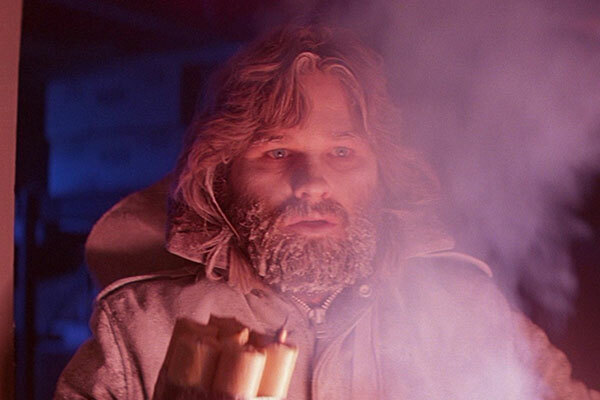 Famously rejected by audiences and critics upon its 1982 release, John Carpenter’s The Thing – a remake of the atomic age classic The Thing From Another World – has since earned a well-earned reputation as one of the greatest creature features in cinema history, thanks in no small part to the incredible practical effects work of Rob Bottin. The set-up is near-perfect for effective terror; a snowbound team of Antarctica scientists find themselves besieged by a shape-changing space monster that can assume the identity of any of them, turning the already psychologically frazzled and isolated men against one another. A celebrated master of suspense thanks to this breakout film the original Halloween, Carpenter expertly brings the atmosphere of tension and paranoia to a nail-biting boil, culminating in explosive scenes of mind-bending body horror that showcase Bottin’s masterful creature work and give his all-male cast – led by the ever-charismatic Kurt Russell – some real dramatic turf to chew on. With Wilfred Brimley, Richard Masur and Keith David. There is some small synergy to the fact that Jonah Hill’s directorial debut Mid90s should be such a masterful dissertation on the pains of male adolescence; Superbad, the teen comedy that put him on the map, was a rite of passage film for teens of the mid-aughts. But where the latter was an homage to male posturing, Hill’s film – which he both wrote and directed – seeks to dig deep into the hardened heart of the male experience through the story of a 13 year-old LA kid (Sunny Suljic) who seeks refuge from a highly dysfunctional home life with a group of older skateboarding teens during the titular mid-90s. Deftly managing a cast of non-professional actors – all of whom deliver convincingly authentic performances – Hill’s film leans on nostalgia while retaining a clear-eyed integrity; like last year’s Lady Bird, Mid90s is a welcomingly frank and funny coming-of-age story that marks an auspicious beginning for its author as a cinematic storyteller. With Katherine Waterson.